Want a seed bed that is suitable for planting? Then look no further than this 6 ft excellent heavy duty disc harrow. You won’t waste any time working on your land when you choose this handy disc harrow which has been designed to easily transport in mounted condition using the tractor lift. It can be used in open field working for shattering of clods, preparation of soil for sowing and burial of organic substances and crop residue. 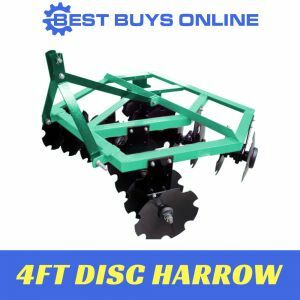 Just attach the disc harrow to your tractor, this tool does it all from medium to hard soil conditions, enables you to break-up and loosen soil clods. High quality bearings and hubs ensure smooth operation and put minimal load on the tractor. High quality seals prevent the entry of mud and water into the bearings and hubs.